The reasons why a sound-artist might specifically limit the locations where sound is captured are numerous. 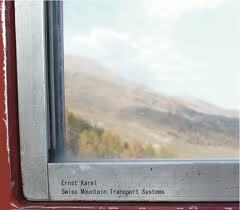 In this case Ernst Karel has chosen the many transport systems typical of a mountain as the subject of a meticulous investigation. Ski lifts, chair lifts and cable cars, chosen for their particular and varied characteristics (age of construction and design etc) have been carefully researched, with all locations limited to within Switzerland. The main suggestion that runs through the project is the integration of “machines” and “landscapes”. The insistent drones are often the result of brand new technologies, but feel as though they are perhaps not rooted and peculiar to those exact places. The mechanical, physical and atmospheric elements coexist charmingly in Ernst Karel’s sequences, which reverberate with space age and industrial influences. In the recordings there appear calmly intermittent robotic sounds that rattle and vibrate in tense structures. A rarefied atmosphere prevails, with few signs of human presence. Time feels dilated; there is a sense of nostalgia evoked by uninhabitable places, with recordings made both inside and outside the cab – a crossing through space that forms an additional, fully outlined ambience. The movement here is acted out but remains still; we listen from a top-down perspective, but enjoy a simplicity of experience and perceptions.